The ability to receive and analyze data and information in real-time has notable benefits across almost every industry, and staying competitive in a data-driven world means working and making decisions incredibly fast. SAS Event Stream Processing is a real-time dashboard that’s designed to let you monitor live event streams from a single location. 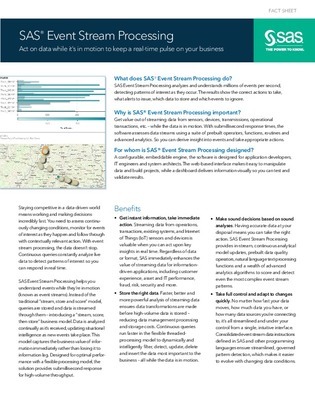 Read this fact sheet to see why you should be using real-time data analysis to drive your decision-making.